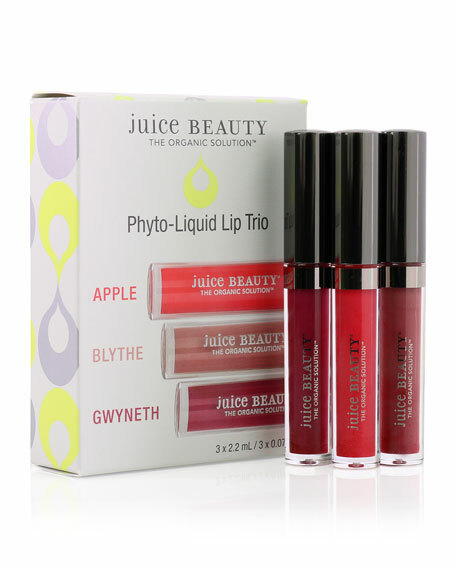 A perfect trio of Phyto-Pigments Liquid Lip in three bold, festive shades to wear during the Holiday period. Each Liquid Lip lays down the intense, vivid pigment of a lip stain and achieves a high-shine finish without feeling tacky or drying. Ideal for on-the-go color touch-ups and smooth, even coverage for all occasions. Contains the Juice Beauty exclusive Moisture Plant Blend (glycerin, betaine and phospholipids) to increase skin hydration and the Juice Beauty Phyto-Pigments exclusive blend of cape lilac and coccinia gourd. For all skin types and for all ages who are looking for a beautiful lip color collection. For in-store inquiries, use sku #2427205.